Looking for different ideas instead of candy this Halloween? We know that Halloween might not have the same excitement associated with it as when you were a kidAnd whether you're heading to a party, taking the kids out or handing out candy on Halloween night, it should still be a fun occasion. Still, many of us in adulthood are over the days of binging on candy -- but that doesn't mean you don't deserve a little treat. Bloomex.ca offers a variety of great ideas for those that are past their candy days. How about surprising your significant other or that someone special with a bouquet delivery. We have several bouquets available that are tailored to the season with orange shades that are quite festive for Halloween. Autumn Glory bouquet: Sunflowers, Gerbera Daisies, Chrysanthemums and Carnations come together in a glorious fall-styled arrangement. $44.95. 12 Long Stemmed Orange Roses: A vibrant take on an old classic, you can't beat the value on these orange roses, priced to move at just $39.95. 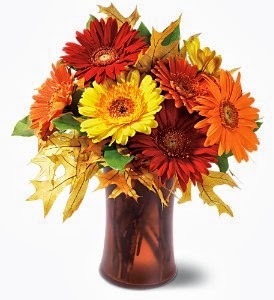 Autumn Gerberas: This fun arrangement puts the shades of the season into beautiful Gerbera Daisies, and is a steal at just $39.95. an amazing value at just $24.95. Bloomex.ca is your number one source for gift baskets in Canada. We have many different types of baskets, from delicious foods to other sorts of treats. Here a few ideas. 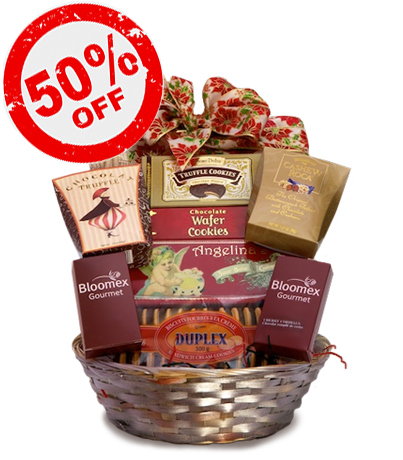 Chocolate Gift Baskets: how about picking away slowly at a gorgeous gift basket rather than gorging on October 31st? Sweets Baskets: Our sweets baskets include all sorts of tantalizing treats, including cookies, cheeses, nuts and dried fruits and lots of other delectable snacks. Spa Gift Baskets: What a nice reward for the parents taking the kids out on a cold Halloween night in Canada. Pamper yourselves with these luxurious baskets, starting at just $24.99. Whatever you decide on, Halloween is a great time to treat yourself. Enjoy the trick-or-treating! We know that Halloween might not have the same excitement associated with it as when you were a kid. And whether you're heading to a party, taking the kids out or handing out candy on Halloween night, it should still be a fun occasion.